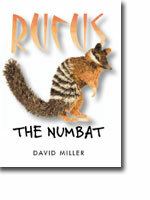 When Rufus decides to pass through town on his way to the bush, what follows is mayhem! With the resulting ruckus, it’s hard to imagine Rufus prefers the quiet life. The cause and effect of the little numbat’s journey is expertly told through Miller’s wonderful 3D paper sculptures. Cyclists, paint tins and Chinese dragons are all upended as Rufus scurries on his way, seeking out the sights and sounds of his favourite habitat. And, of course, with the aid of a skateboard, he finally makes it home none the worse for wear—unlike those left in his wake. With its sparse text and busy illustrations, this title is ripe for reader interaction. After just a few readings littlies will know the words by heart and will, no doubt, be building on the story by adding their own. Miller’s first picture book was the hugely successful Boo to a Goose by Mem Fox. He has since gone on to illustrate many more, including CBC short-listed Snap Went Chester (written by Tania Cox), Refugees, and Ford Street’s, Big and Me.